"Contemporary women. Who are actually free. Why are we in a Convent in the middle ages, huh?" "Because we still hate ourselves. I hate myself. Don't you? I hate my face and my body. I hate my thoughts. I hate my self-hate!" Jessica Dickey's debut play The Amish Project told a fictionalized version of a 2006 incident in which five Amish girls were taken hostage. (See Curtainup's review of a regional production here). This earlier play comes to mind as one first glimpses her newest work, The Convent: two women, clothed in identical plain dresses, sweep and fold amidst fields of gently blowing grain. But, unlike with Dickey's Amish characters, this is not a way of life for these women. Instead, they don these costumes once a year, as part of a special retreat for women to connect with themselves, their desires, spirituality, and personal divinity. With Daniel Talbott directing, The Convent is a satisfying, if occasionally uneven, dramedy that looks at what it means to claim personal fulfillment, and where doing so might conflict with what we owe others. There are certainly universal takeaways, but the context of the work is specifically and unabashedly focused on women, with an all-female cast and a setting that excludes men by definition. Occasionally Dickey flirts with more tragic or sinister stories, whether calling to mind the Amish tragedy, offering a story about a cult compound, or suggesting the possibility for a Secret History–style hallucinogenic bacchanalia gone awry. In reality, though, there's no crazy plot machinations afoot. In fact, the biggest reveals of the story are ones you'll probably see coming. Instead, she ekes humor and sorrow out of the relationships that account for each woman's presence at the Convent. 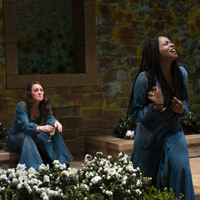 The play gets off to a slow start because of how long it takes to reveal these—the first scenes are heavy on exposition and quarterbacking by the Mother Abbess (Wendy vanden Heuvel)—but they prove compelling once they come to the fore. The most dramatically rich dynamic is that between Patti (Samantha Soule), a returning attendee at the Convent, and the Mother Abbess. Both of these characters also cultivate interesting links with Jill (Margaret Odette), a woman adrift in her life and her marriage. Two longtime attendees, Bertie (Amy Berryman) and Dimlin (Annabel Capper) have their own history to navigate. Meanwhile, for Tina (Brittany Anikka Liu) and Wilma (Lisa Ramirez), their interest in the Convent has more to do with recently severed connections in their lives. The ensemble is made up of strong performers, and each is given at least one standout moment that feels uniquely of that character. This speaks not only to the actors' abilities but also to Talbott's attention to nuance. But overall the work doesn't always feel like an ensemble piece. One reason for this is the privileging of longer monologues over group interactions. Another is inconsistent degrees of character development. We never get more than fragments of a backstory for Bertie and Dimlin, and the resolution of their plotline seems almost like an afterthought. The focus for Tina and Wilma on characters and ideas that go unseen also leads to journeys that seem to peter out. Things are richer at the other end of the spectrum. Soule delicately portrays Patti's complicated relationship to the Convent, a place she chafes at yet is drawn to. As the Abbess, vanden Heuvel can hold court in one scene and offer genuine humanity and vulnerability the next. Jill's struggle in her current position—she is intoxicated by the retreat but fears its implications on her life back home—is thoughtfully borne out by Odette. The A.R.T./New York Mezzanine Theater is an impressively flexible space, operating as a blank slate that seems to be entirely reconfigured with each new production. Set designer Raul Abrego takes advantage here with an immersive, weighty set which recreates the looks and shapes of medieval architecture. Activated by Katherine Freer's extensive projection design, the set becomes unexpectedly flexible and transporting. Additional environmental contributions come from light designer Joel Moritz and sound designer Erin Bednarz. Tristan Raines uses costumes to further the sense of place, but also to gesture towards the women's lives outside the Convent. The design and staging foster a sense of intimacy that makes it easy to become engrossed in the play, despite areas where it feels less polished. Pushing the longer end of a one-act (100 minutes), the play nonetheless moves briskly. Dickey has a natural ability to use language to probe emotions, and to sneak up on an audience with humor where it isn't expected. Executed by an able cast and a thoughtful director, it makes for a memorable stay at The Convent.